The Wall Street Journal wrote about Rye whisky in 2006 and 2011. The New York Times wrote about it in 2006 and 2011. Jason Wilson of the Washington Post has written about it on at least two occasions. Once in 2009, and again in 2012. Bloomberg just published an article on April 29, 2013. What makes this trend even more interesting is the fact that many of the Rye whiskeys that have been appearing on the shelves over the past few years come from the MGP Distillery (formerly LDI and formerly Seagrams) in Lawrenceburg, Indiana. The Dickel, Bulleit, and High West Rye whiskeys that I reviewed in early April were all distilled at this facility, and the Angel’s Envy Rye, which is the subject of today’s blog post, may have also been distilled by MGP (click here to read a recent article about MGP by Chuck Cowdery). We’re particular about our whiskey. So when Lincoln Henderson decided to make a rye, he took an unconventional approach. As a malcontent, it’s just his nature. We began traditionally enough, insisting upon the perfect taste profile at 95% rye. Even the water has to be right. We can be a handful to work with, but the extra effort always seems to pay off. So where other ryes would have stopped, we chose to finish. Lincoln decided that a rum finish would provide the perfect complement to our already exceptional rye. We chose rum barrels that had previously been used to age French cognac. Long story short, our barrels are vintage and very well travelled. We finish our rye for up to 18 months in these Franco Caribbean casks, resulting in a rare and immensely complex, but incredibly drinkable whiskey, even at 100 proof. With only 2,500 9-liter cases at launch, Angel’s Envy Rum Finished Rye is an extremely small batch release, and we sincerely hope you get the opportunity to enjoy a bottle—neat, mixed or in good company. Aging: 6 years in new American oak charred barrels followed by 18 months in Caribbean rum casks. The rum casks began as French cognac barrels. Interestingly enough, while they don’t explicitly state that this whiskey was sourced from MGP in Indiana, from what I have read about this whiskey on several other blogs, the mashbill is what gives it away as yet another MGP sourced Rye whiskey (click here to read Sku’s Recent Eats “How do you know it’s LDI?” post). Appearance: Orange blossom honey in color. Aroma: Up front, there is an aroma of iced animal crackers and Lyle’s Golden syrup. Then, candied fruits and finally a little of the rye. Taste: The flavor is very sweet but very pleasant with a nice combination of rye and cane sugar. I found the typical rye heat to be somewhat muted and replaced more with a warming sensation that created a very long finish. Conclusion: I tend to like things on the sweet side so this was right in my wheelhouse. 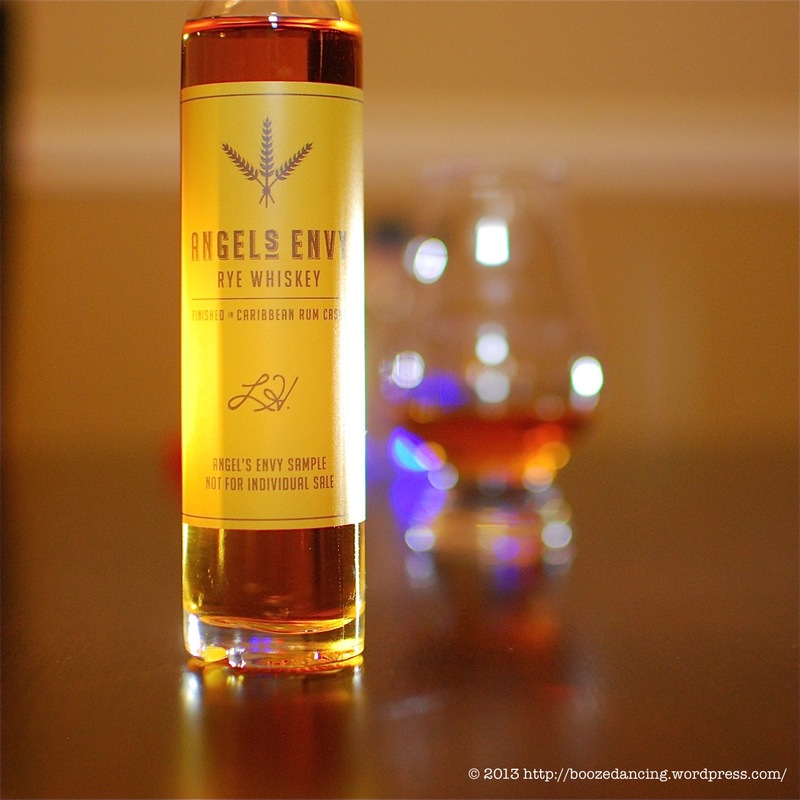 I really enjoyed the Angel’s Envy Rye as I found that the rum finish made it stand out against a more traditional rye. It was like a good rye went on a trip to the Caribbean and brought back a souvenir. Aroma: There is a great deal of sweetness coming through when I first stick my nose in the glass. I get a total Banana’s Foster vibe , i.e. brown sugar, sweet cream butter, ripe bananas, and vanilla. Now I don’t know if it’s the power of suggestion or a genuine aroma that I’m picking up, but once I read the words “Cognac barrels”, I started getting a subtle strawberry shortcake aroma that I get when nosing Brenne. Once you work past all that sweetness, the classic rye notes break through. Cinnamon, some peppermint, and a hint of allspice are all there. Taste: Quite a light mouthfeel with just a touch of oiliness. Moderate cinnamon heat backed with vanilla and brown sugar sweetness at the onset. At mid-palate, the cinnamon spiciness starts to build and the herbal notes start to make an appearance as you inch towards the finish. It all comes together in the end: vanilla, cinnamon, brown sugar, menthol, and allspice. All of these flavors linger for several minutes. Conclusion: I didn’t really care for the Angel’s Envy Bourbon. There wasn’t anything particularly wrong with it, but I just didn’t find it to be all that exciting. It was too subtle and restrained for my taste. That being said, my feelings for the Angel’s Envy Rye are the exact opposite of what I felt about their Bourbon. This stuff is friggin delicious! We’ve already mentioned that this Rye whiskey is made at the same distillery in Indiana that makes the vast majority of Rye whiskey that you see on the shelves these days. What sets this Rye whiskey apart from the others is the rum cask finishing which totally changes the flavor profile, and the slightly higher ABV which also adds to the much bigger flavor. My only concern about this whiskey is the price. Per the press release, the MSRP is $80. When you consider that the High West Rendezvous Rye which is a blend of 6 and 16 year old Rye whiskey from the same distillery goes for around $45 to $50, it’s difficult to avoid the “value” question. Would I buy a full bottle? I’m not sure yet, but I would definitely give it some serious consideration before making a final decision. Many thanks to Ro-Bro Marketing & PR for sending us this very generous sample! Iced animal crackers? I’ve only had a few minutes to consult the Second Restatement of Bloggers Tasting Notes on Brown Spirits (ed. 2010) but it seems clear that one may not reference iced animal crackers without further specifying both the color of the icing and the particular animals by genus. Pink and white icing have subtle, yet significant differences which should not be overlooked. Moreover, the penned or domesticated animals such as bovines and equines impart dramatically different undertones than do the ferae naturae such as giraffe and hippopotamus. I could be wrong but I doubt it because I checked my schedule and I have wrong call already set for later this afternoon. But let’s not get too distracted in the weeds… I was chatting with a soon to be new neighbor on Monday who’s a self-professed “bourbon guy.” He mentioned that he’s got 2 bottles of Angels Envy on the mantle that he hasn’t tried yet. One was the straight bourbon but he wasn’t sure about the other. Sounds as though it might be the rye. He seemed to be saving it for a special event. If I’m lucky, that special event might come late next week when he moves into the house behind me (assuming he invites the snarky craft beer evangelist right behind him). Interestingly enough, I can’t say that I’ve ever had an iced animal cracker, but given Limpd’s skills at maintaining a well stocked pantry, beer fridge, and liquor cabinet, if he says “iced animal crackers”, then I believe him. Now I too am curious as to what form of animal this whisky smells like! So you’ve lost a Single Malt Guy and gained a Bourbon Guy. If the new kid on the block is half as cool as the guy he’s replacing, then I’d say you came out even in this real estate transaction. Plus, you gained a place to stay for the Great American Beer Festival. As far as those two Angel’s Envy bottles, they might both be Bourbon since they have a 90 proof version and a Cask Strength version. Look forward to hearing all about it! Thanks Peter! After going back and forth with you on Facebook (re: Josh Feldman’s tasting notes) and Jordan Devereaux on Twitter, there was no way I could write this up without bringing up the cost issue (a valid concern given all of the stuff you brought up about the distillate, casks used, and costs of other comparable Ryes). You had me at Rye Whiskey ….. any left?? Sadly, there is none left. Just saw it on the shelf at WineWorks for $65. Before buying a bottle, I’d be curious to see what a Bulleit or Wild Turkey Rye and Rumbullion blend would taste like (I recall you liking the BreckBullion awhile back). Check out the link that I put in one of the comments above. Sounds interesting no? The BreckBullion cocktail was more something of a curiosity to make the Rumbullion drinkable than something I liked. It was good but a bit of a waste of the Breckenridge. Besides all that I am not sure what the Breck has to do with Rye Whiskeys.